Did you know that when you eat a banana, you’re more often than not eating the very specific Cavendish variety? And did you know that before the 1950s, it would’ve been the Gros Michel, or Big Mike, variety? The favorite might still be the Gros Michel if it hadn’t been for a fungal blight that irreparably damaged its cultivation and export. Because modern cultivated bananas are without seeds and cannot reproduce sexually, new plants can only be developed from cuttings. This means that almost all bananas of a variety are genetically identical, meaning that any single variety will be universally susceptible to a particular blight, being unable to develop better defenses through sexual reproduction and deepening of the gene pool, much like inbreeding in dogs and humans (don’t get me started on monocultures!). Green and unripened on the left. Yellow and ripe on the right. What does this have to do with plantains? 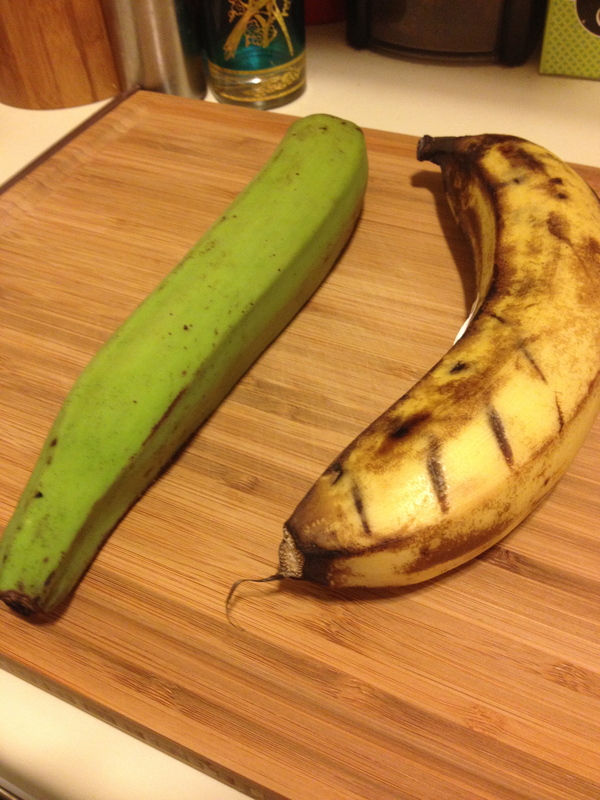 Plantains are one of thousands of banana variants that are overlooked quite often in the USA. In the Caribbean, Central America, and Africa, they are known to make up as much as 25% of an individual’s carbohydrate intake. 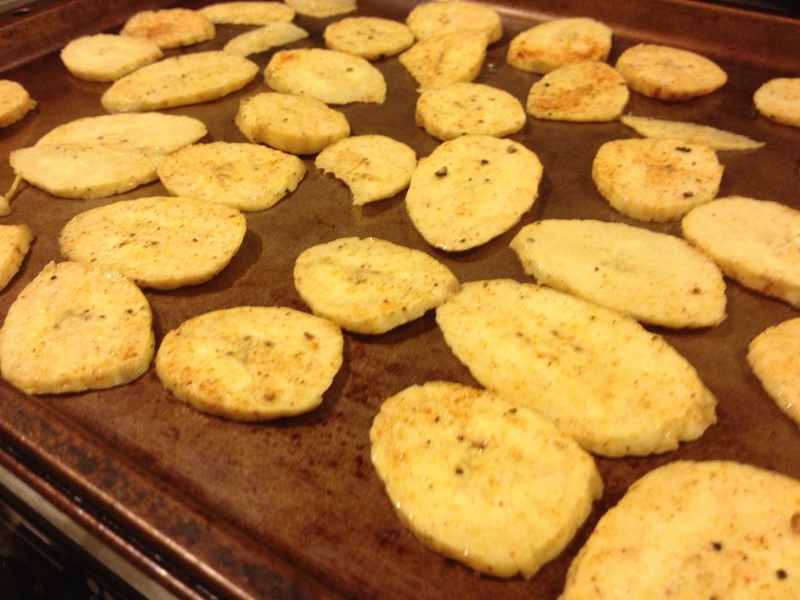 Plantains are much starchier than a Cavendish banana and have a more neutral flavor and considerably less sugar. They can be consumed green and unripe, yellow and moderately ripe, and even so far as black and sticky sweet inside. They can be boiled, steamed, baked, fried… The possibilities are really quite endless. I guarantee that I will have more techniques and dishes for you, but I thought I’d start simple with something that will fill a textural desire I think we all feel. Mmmmm… crunch! 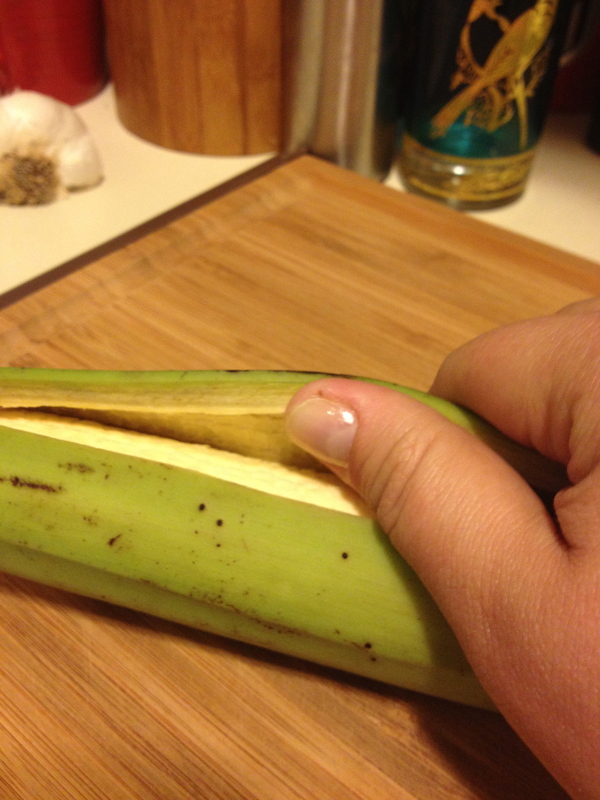 Opening up a green plantain can seem daunting at first. They do not peel like a banana would, but with a little practice, it’s really simple and quite fun. Cut off both ends of the plantain, then run the tip of the knife lengthwise along the ridges of the fruit on a slight angle. You just want to get through the peel, avoiding slicing the meat if you can. At this point, very gently and patiently start prying the peel off along the ridges. It will come off easier than you think. The first time I watched someone else do it, I thought surely she had some sort of Caribbean hoodoo on her side! 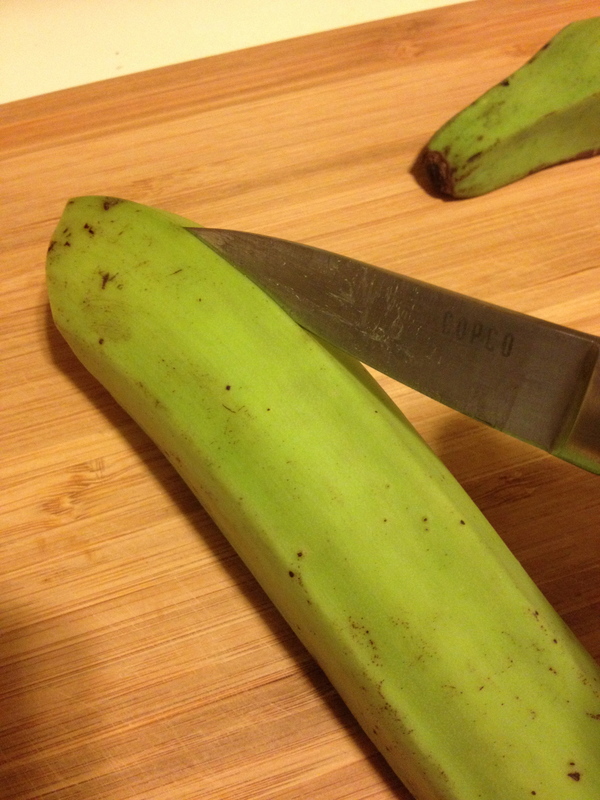 Once the meat of the plantain is exposed, start slicing as thinly as you can manage. If you want more surface area, you can slice on an angle for longer pieces. This would be especially nice for dips (hint, hint). Toss the slices in the bowl with your chosen fat and spices (I used salt, pepper, and paprika) and spread on your baking sheet in a single layer. If you want your chips to crisp, you don’t want them all up on top of each other. Let cook for 20-25 minutes, moving around occasionally. Keep a close eye on them, they’ll turn on you really quickly. When they’re crisp, remove from the oven and do a little last second seasoning. I always find they need a touch more salt. Kick back and snack! I am an avid banana-hater. 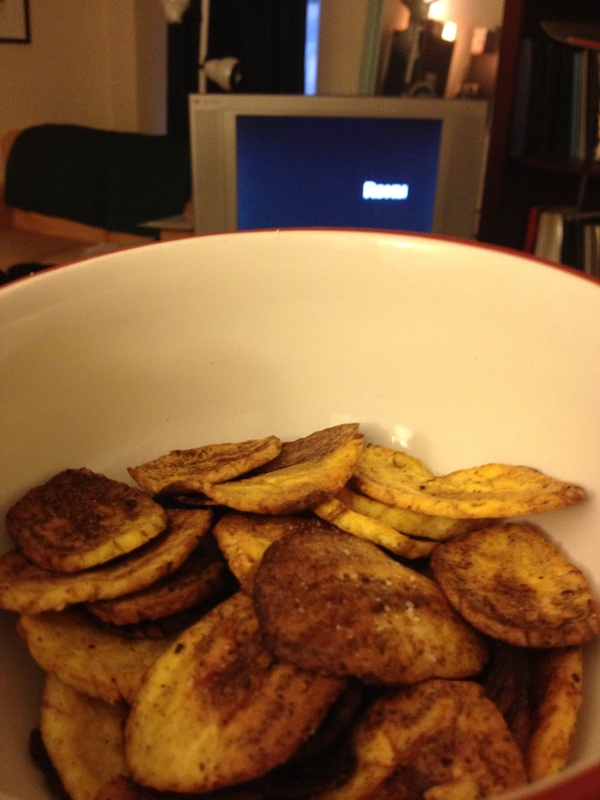 Just the smell of them makes me gag, but I looooooove plantains! So, even if you don’t care for bananas, be brave. Give it a shot. You may find yourself surprised!